A SpaceX Falcon 9 rocket stands atop Space Launch Complex 4E at Vandenberg Air Force Base in California in this file photo. SpaceX's next Falcon 9's launch is now aimed for Feb. 21, 2018. SpaceX has delayed the launch of its next Falcon 9 rocket to no earlier than Wednesday (Feb. 21) to allow final checks of the rocket's upgraded nose cone. 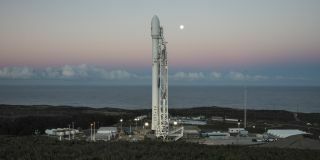 The Falcon 9 rocket was scheduled to launch early Sunday (Feb. 18) from a pad at California's Vandenberg Air Force Base to send SpaceX's first Starlink broadband satellites and the Paz radar-imaging satellite for Spain into orbit. The mission had already been delayed 24 hours to allow extra checks. "Team at Vandenberg is taking additional time to perform final checkouts of upgraded fairing," SpaceX representatives wrote on Twitter. "Payload and vehicle remain healthy. Due to mission requirements, now targeting February 21 launch of PAZ." SpaceX has been upgrading its payload fairings as part of a project to recover and reuse the components, but whether those efforts played a role in the launch delay is unclear. SpaceX CEO Elon Musk has said the fairings alone cost about $5 million, so the ability to reuse them could represent a substantial savings. Earlier this month, Musk said SpaceX is getting closer to recovering its payload fairings. The company has been experimenting with parachutes on its fairings and built a giant ship equipped with metal arms (which Musk has described as a "catcher's mitt in boat form") to eventually catch the fairings before they splash into the ocean. After SpaceX's successful Falcon Heavy test flight on Feb. 6, Musk told reporters that Falcon 9 rocket fairing recovery has been difficult since fairing parachutes tend to get twisted during descent. But Musk was optimistic that a solution would be found this year. "I'm pretty sure we'll solve fairing recovery in the next 6 months," Musk said. SpaceX's next Falcon 9 rocket will use a previously flown first stage booster that also launched the Taiwanese Formosat-5 satellite in August 2017. The mission's primary goal is to launch the Paz radar-imaging satellite for the Spanish company Hisdesat. The Paz satellite is designed to capture sharp radar imagery of Earth for a variety of customers, including the Spanish government, over the course of its 5.5-year mission. SpaceX is also expected to launch two prototype satellites, called Microsat-2a and Microsat-2b, as part of its Starlink broadband satellite constellation. The company has not commented on the Starlink prototypes publicly, but their inclusion on the launch was laid out in SpaceX documents filed to the Federal Communications Commission. You can watch the next Falcon 9 launch here courtesy of SpaceX, or directly via SpaceX's website. The webcast will begin about 20 minutes before liftoff.